Soils form as a product of physical, chemical, and biological activity at the outermost veneer of Earth’s surface. Once buried and incorporated into the sedimentary record, these soils, now paleosols, preserve archives of ancient climates, ecosystems, and sedimentary systems. Paleopedology, the study of paleosols, includes qualitative interpretation of physical characteristics and quantitative analysis of geochemical and mineralogical assays. In this chapter, the paleosol macroscopic, micromorphological, mineralogical, and geochemical indicators of paleoecology are discussed with emphasis on basic analytical and interpretative techniques. These data can reveal a breadth of site-specific interpretations of vegetation, sedimentary processes, climatic variables, and durations of landscape stability. The well-known soil-forming factors are presented as a theoretical framework for understanding landscape-scale soil evolution through time. Vertical and lateral patterns of stacked paleosols that appear in the rock record are discussed in order to address practical approaches to identifying and describing paleosols in the field. 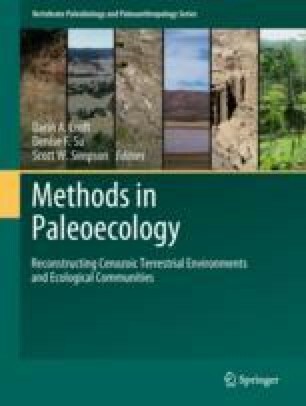 This chapter emphasizes a robust multi-proxy approach to paleopedology that combines soil stratigraphy, morphology, mineralogy, biology, and chemistry to provide an in-depth understanding of paleoecology.